Las Vegas police respond to The Cosmopolitan hotel-casino to investigate a fatal car-to-car shooting Friday, Feb. 19, 2016. LAS VEGAS, NV -- Las Vegas police say two people are dead and another is injured after an early morning shooting near the Strip. Lt. Dan McGrath told Las Vegas TV station KVVU-TV that a fight broke out Friday in a parking garage at the Miracle Mile Shops. About 10 minutes later, police got word of the shooting. 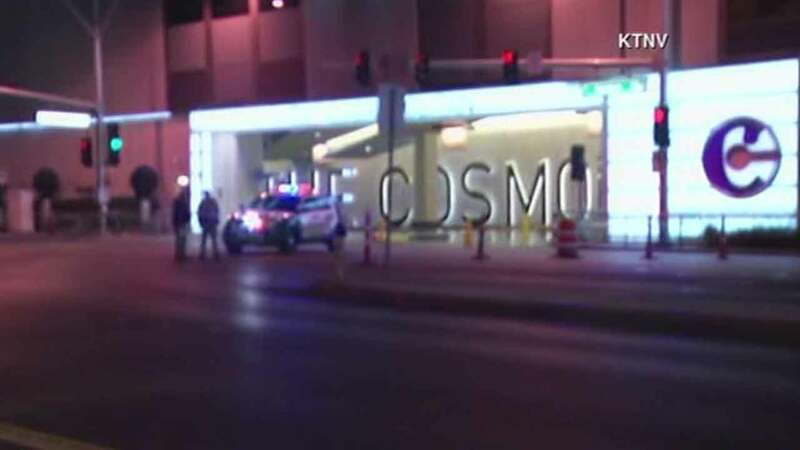 Police say a car drove into the valet of the Cosmopolitan hotel on the Strip with a fatally injured woman and a wounded man inside. A second woman was found in the street at the scene of the shooting and died hours later. Police say they are reviewing surveillance video of the fight. McGrath says no one is in custody.